This rare piece of Irish aviation history is “Chatelaine”, essentially a key ring, possibly engraved by Thomas Read of Dublin, Ireland who was a cutler and sward maker in the late 18 th century, to commemorate Sir Richard Crosbie’s first flight in a balloon. The National Museum of Ireland has similar pieces from Read on display but no known artifacts relating to Richard Crosbie or his flights are housed in their collections at this time. The age of the item is determined to be 1780, based on similar chatelaines in the museum’s collections. 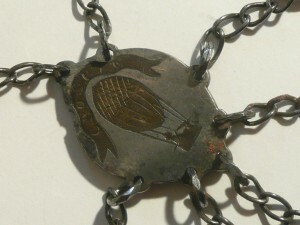 This item may have also been fashioned in Birmingham, England and then engraved in Ireland. Thomas Read was listed in the 1862 Dublin Street Directory and Eamon Mac Thomais noted in his priceless Me Jewel and Darlin’ Dublin that: “Thomas Read of 4, Parliament Street was established in 1670, and was once one of the oldest cutlers in the world.” Unfortunately, the show was closed after the demise of the Celtic Tiger and is not a pub! The word “chatelaine” derives from the Latin word for castle. It refers to the lady who, in medieval times, was in charge of the day-to-day castle functions. The chatelaine ordered supplies, did the book-keeping, and supervised the servants. She also taught the children who lived in the castle and served as a guide to guests. One of her most important responsibilities was to keep the castle keys, she needed a place to put them where they would be safe and accessible. By the 17th century, a metal, jeweled ornament, called a chatelaine, was a popular, practical organizing to device. It hung from a pocket or attached to a person’s belt. Dangling down from the chatelaine would be several chains and hooks. Keys, a pen and a note-pad were among the things that could be carried on the chatelaine. 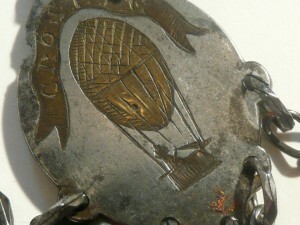 This chatelaine is fashioned from steel, with small attachment rings all round (one side of the main badge has a broken hole, as it would have been suspended by three chains). The keys or other items would have dangled from the five large rings. The main badge has “REAL” engraved onto both sides and is believed to original and the use of the word “REAL” was to prevent forgery with more than 20,000 spectators in attendance from this historic flight. The central steel part is engraved with an Irish Harp with Shamrocks below a crown over it, meaning this is a peerage item. The other side says “CROSBIE” on a scroll above the balloon. I am researching this piece to see if it could have been used to raise money, or to admit the special spectators at the first flight made by Sir Richard Crosbie on January 19th, 1785. Richard Crosbie was Ireland’s first balloonist, born in 1755. He made the first hydrogen balloon flight from Ranelagh Gardens and landed close by at Clontarf. He was 30 years old at the time. My first step is to determine the his tory of this item and discover if it’s an artifact from this historic first flight. The next steps will be to donate to a museum in Ireland and return this item to the old sod! If you can provide additional information relating to this item or any other items related to Sir Richard Crosbie or Ireland’s lighter than air aviation history, I would be most interested in purchasing or learning more about Irish aviation history.